You are on your annual holiday in the Caribbean. 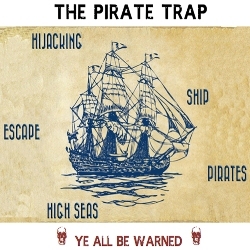 While cruising one night, you suddenly hear a ruckus on your ferry “Ahoy, Mateys!”; the Pirate and his crew have come on board to take everyone hostage. They put you inside a room on their wooden ship and sail towards the Pirate’s Cove, which is an hour away. Can you work effectively as a team and use your collective wits to escape from the locked room before the ship touches the shore in 60 minutes, or will you be grounded and forever stranded on the deserted island? Your son’s been missing. 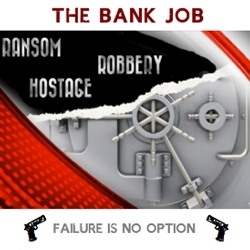 Just then a mafia don leaves a ransom note at your doorstep: “Your kid’s life, in exchange for a simple job.” Only that the job is to rob a local bank that holds some valuable secret about the mafia boss. “Why me?” you’d ask. Because you happen to be the ex-manager of that bank and you still know your way around.